These Chinese mushroom dumplings are filled with two kinds of mushrooms, bamboo shoots, and tofu. With aromatic herbs and savory seasonings, they are delicious pockets of fun textures and flavors. They can be steamed or pan-fried and keep well in the freezer. 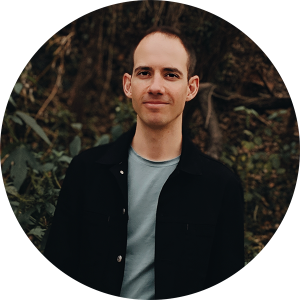 Having spent three years in China in my 20s, I’ve had a bit of exposure to dumpling making. Though I never felt like I made much progress on it while I was there. It’s a pretty common family activity, as it can be very time-consuming without some teamwork. Dumplings are also deeply rooted in Chinese culture. 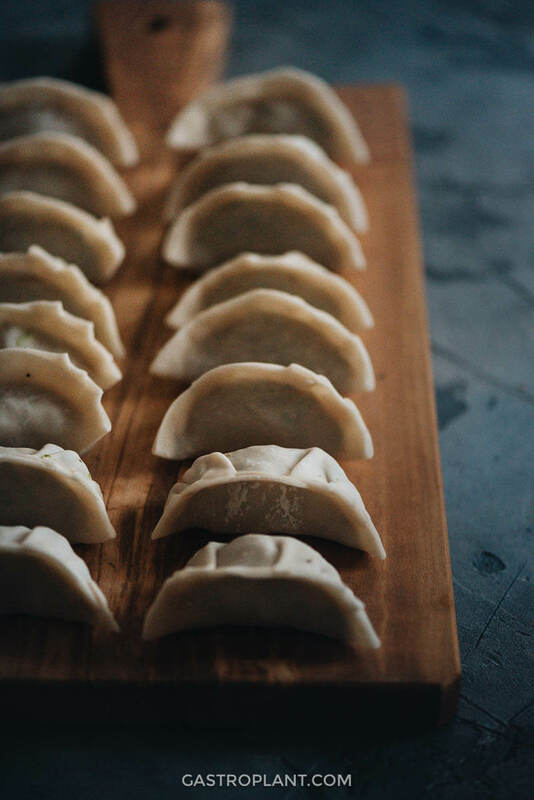 I was invited to try to make dumplings on a number of occasions, and it was always the boiled Northern variety known as shui jiao. Dumpling making was always fun. It’s a social activity where you get to work with your hands. 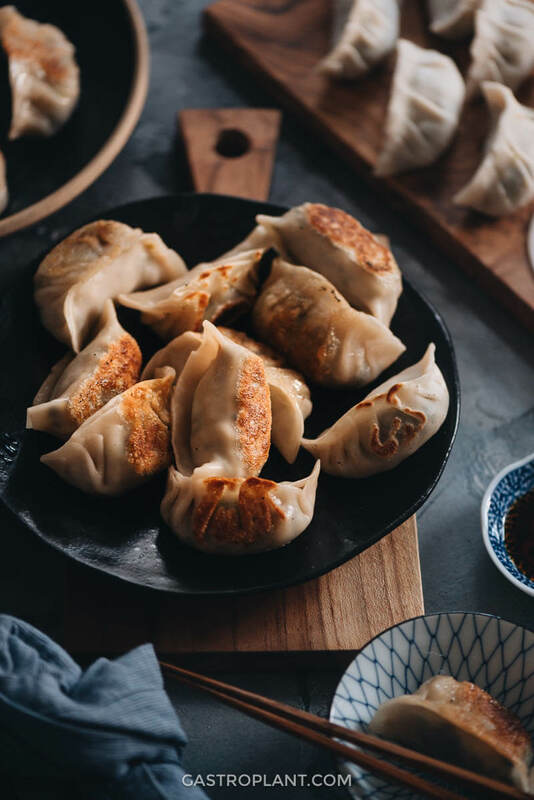 However, shui jiao are among the least forgiving dumplings – a small slip-up in the formation of the dumpling and the whole thing unravels in the rapidly boiling water. It was a little discouraging that most of the dumplings I made didn’t survive, but at least I was surrounded by competent dumpling makers so there were still plenty of good ones to eat in the end. Later on, I wanted to stay connected to China through food and my lovely wife encouraged me to try making potstickers (rather than the boiled shui jiao). This wasn’t until after I had left China, but I was finally able to experience the satisfaction of successful dumpling making. Potstickers don’t have to be perfectly made, because the cooking method doesn’t agitate them the way boiling does. They don’t even necessarily need to be airtight. Some are even left intentionally open-ended. 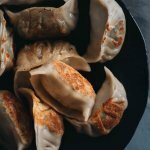 If you haven’t made dumplings before, I recommend starting with potstickers like these because you can make them as simple or as intricate as you want, appearance-wise, and they’ll still come out delicious. 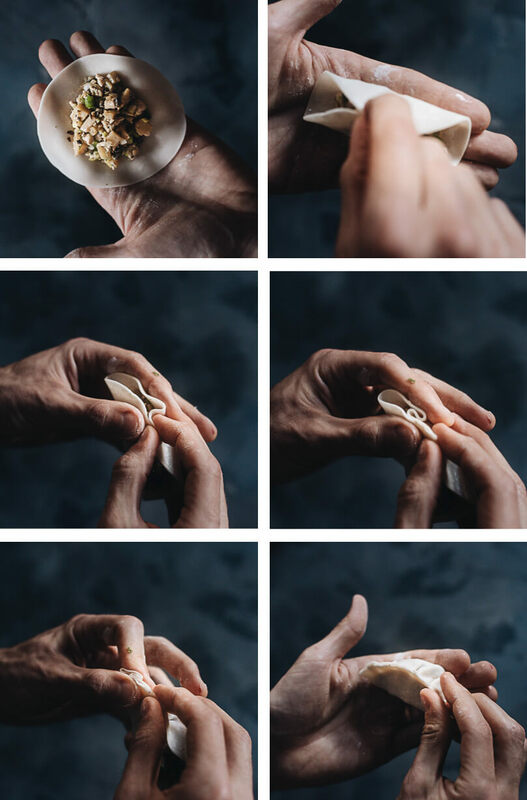 On the simple end, you can make half-moon shaped dumplings. The pleated ones shown here aren’t difficult to make once you get the hang of the half-moons. There are others you can try as well if the pleated ones are too easy. The round baozi shaped ones may be the prettiest and most tricky. But even if you don’t get them perfect, they’ll still be edible and delicious if you steam or pan-fry them. When I was coming up with the filling for these dumplings, I wanted to include a few different textures for good mouthfeel, as well as good round flavor and a pleasant aroma. 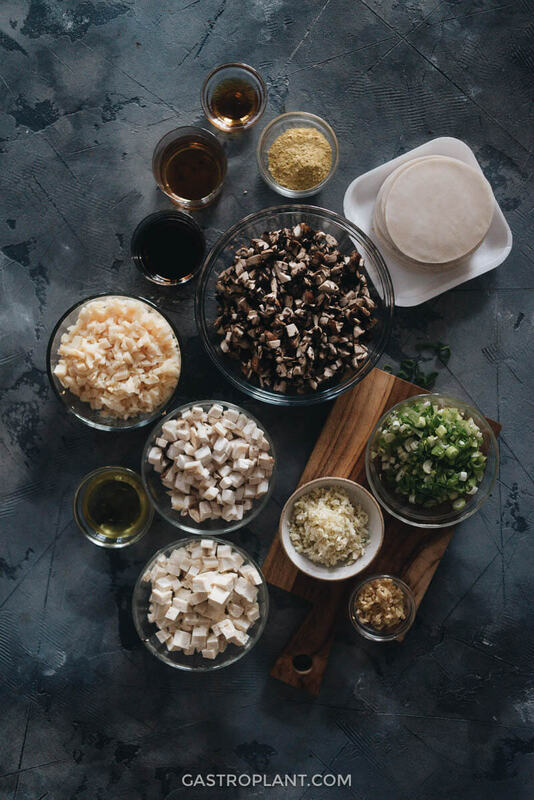 For texture, there is a range of ingredients – bamboo shoots for a crisp crunch, king oyster mushrooms for a meaty bite, and tofu for a tender bite. 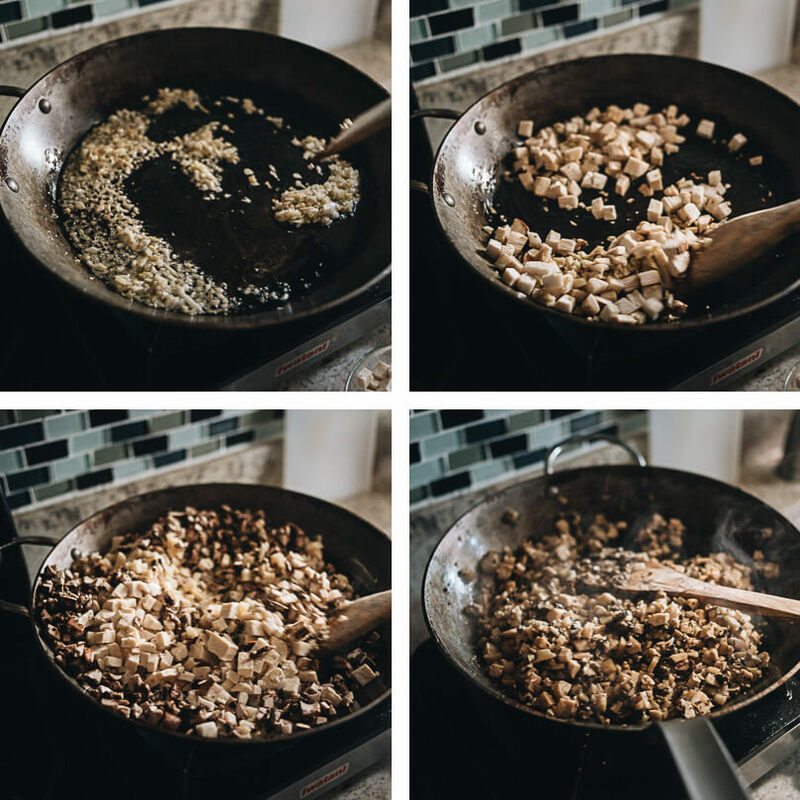 On the flavor side, minced brown mushrooms lend their signature earthy flavor, backed up by ginger, garlic, soy sauce, wine, sesame oil, and nutritional yeast. 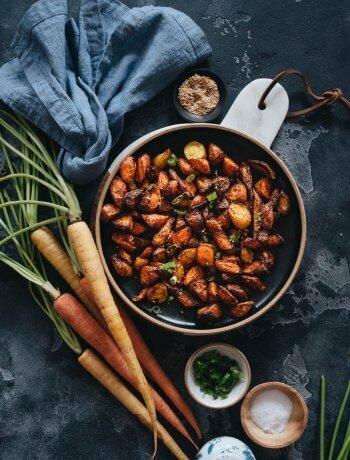 The mushroom is the most forward flavor, but it isn’t overpowering and is balanced well by the aromatics and seasonings. Wrapping the dumplings is the most time-consuming step and will be much quicker if you have a friend or two to help. Once the cooked filling has cooled, and you’ve stirred in the fresh green onion and seasonings, you can start to wrap dumplings. To keep things organized, you should have a station set up. Prepare the bowl of filling, the stack of dumpling wrappers, a small bowl of water, and a plate or tray to hold wrapped dumplings. You can dip your finger in the water bowl if you need to moisten the edge of the wrapper to get it to seal more thoroughly. Some wrappers may be sticky enough that they don’t need to be moistened. Once you’ve wrapped all the dumplings, you can either cook or freeze them. If you’re going to cook them, you have a choice of steaming or pan-frying (i.e. making potstickers). 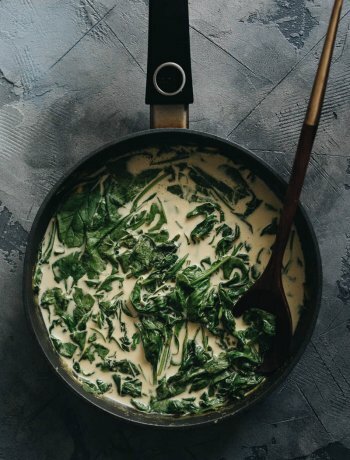 This recipe focuses on the pan-frying method. To see how to steam dumplings see the recipe here, and skip to step 4. The pan-fry process starts by heating oil in a skillet. You place the dumplings in the oil and let them brown for a few minutes without moving them. You can flip them so they get browned and crispy on two sides if you like. Once they’re nicely browned, pour a few tablespoons of water in the skillet and cover it so the dumpling wrappers steam through. You’re really only cooking the wrapper, anyway, since the filling is already cooked. You can use a food processor to chop the ingredients quickly. I would suggest cutting the king oyster mushroom and bamboo shoots by hand, though, to preserve their texture. To freeze the dumplings, spread them in a single layer on a baking sheet and cover that sheet with plastic wrap. Freeze that baking sheet for 24 hours to harden the dumplings, then you can transfer them to a ziplock bag or airtight container. They should keep for a month in the freezer. You can cook frozen dumplings without thawing them first. You’ll just need to steam them a bit longer. See the recipe for details. There are a variety of dipping sauces you can pair with the dumplings. Some people use straight vinegar. A common sauce is three parts soy sauce and four parts vinegar with a drizzle of toasted sesame oil. Chili oil or hot sauce is optional. For more ideas check out this list. The recipe produces 20-25 dumplings. If you’d like to make a different amount, there’s a handy feature for that. Click on the number of servings (dumplings) in the recipe below and drag the slider to your preferred amount. The quantities in the entire recipe will be adjusted accordingly. 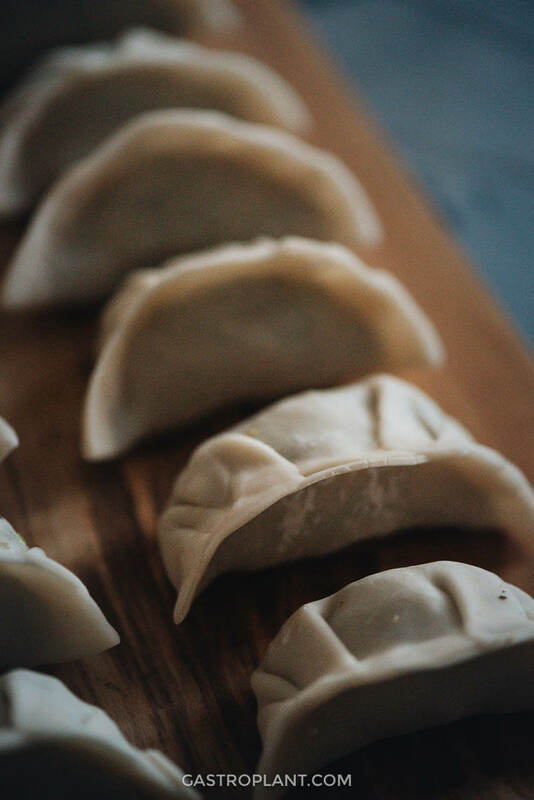 These plant-based Chinese dumplings are filled with two kinds of mushrooms, bamboo shoots, and tofu. With aromatic herbs and savory seasonings, they are delicious pockets of fun textures and flavors. They can be steamed or pan-fried and keep well in the freezer. Heat oil in a large skillet over medium heat until hot. Add ginger and garlic. Stir until fragrant, about 1 minute. Add bamboo shoots, brown mushrooms, king oyster mushrooms, and tofu. Sprinkle the salt over those ingredients. Cook and stir until the mushrooms release their liquid, that liquid evaporates, and the mixture is nearly dry, about 7 minutes. Add the Shaoxing wine and soy sauce and stir, scraping up any bits that are stuck to the skillet, for 1-2 minutes, until the liquid is absorbed. Transfer the filling mixture from the skillet or a plate to cool. You can stir the mixture to speed this process up. Once the mixture is no longer steaming, stir in the green onion, nutritional yeast, and sesame oil. 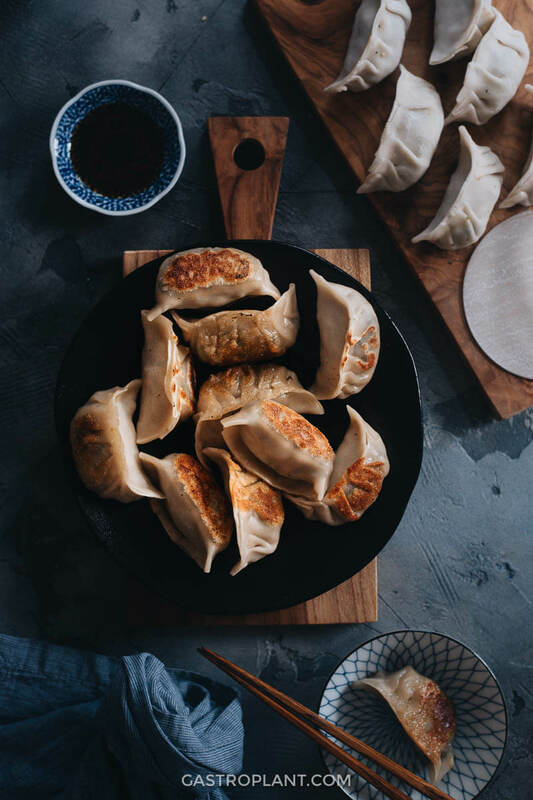 Set up a dumpling wrapping station with the bowl of filling, a small spoon, a small bowl of water, the stack of dumpling wrappers, and a plate or tray to hold the finished dumplings. Place a damp paper towel over both the dumpling wrappers and the finished dumplings so they don’t dry out. Wrap the dumplings one at a time. Hold the wrapper in your left hand and use your right hand to spoon an appropriate amount of filling and place it in the center of the wrapper. Put the spoon down and carefully use your right hand to fold the wrapper in half and pinch the edges of the wrapper together as shown. Press firmly so that the wrapper binds together at this point. Then use both hands, as you like, to press the edges together to seal the filling inside. You can form pleats if you want, but they are not necessary. If the first wrapper does not bind to itself very well, you can dip your right index finger in the bowl of water and use it to moisten the edge of the wrapper. Throughout the process, be careful not to let any of the filling get too close to the edge of the wrapper. Once all the dumplings have been wrapped, you can either freeze them or cook them. To cook the dumplings, heat 2 to 3 tablespoons of oil in a nonstick skillet over medium heat until hot. Add the dumplings in a single layer. Cook until the bottom side turns golden brown, 1 to 2 minutes. Flip the dumplings, add 2 tablespoons water, and cover. Cook for another 1 to 2 minutes, until the bottom turns golden brown. Depending on how many dumplings you make and on the size of your skillet, you may need to fry them in batches. The method for cooking frozen dumplings is the same as above, but you’ll need to add more water, about 1/4 cup, and steam them covered for longer, 5-6 minutes total. 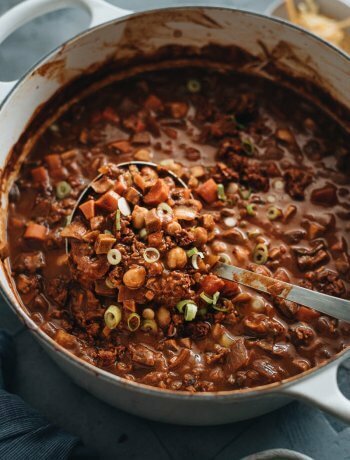 You can use a food processor to chop most of the ingredients. I recommend cutting the bamboo shoots and king oyster mushrooms by hand to preserve their textures. Serve the dumplings with the dipping sauce of your choice. A common one is three parts soy sauce to four parts vinegar, with a drizzle of toasted sesame oil and an optional splash of hot sauce or chili oil. To freeze the dumplings, place them on a baking tray without overlapping and cover the tray with plastic wrap. Put them in the freezer for a day, then transfer them to an airtight container or ziplock bag. They'll keep in the freezer for up to a month. This recipe produces 20-25 dumplings. Feel free to adjust the quantities to make a larger or smaller batch. Click on the number of servings (dumplings) in the recipe and drag the slider and the quantities will adjust automatically.